Welcome, Andrei! One word of warning -- if you're hanging the katana on your wall, be sure that it has a good coating of oil to keep it from rusting. Virginia isn't known for having low humidity. Sorry for late introduction, Im Dion originally from Indonesia and now live in Melbourne Australia although for time to time I visit Indonesia. I usually collecting Kris and went on great lenght in researching it's metallurgy as Im also happen to be member of R&D in Kris National Organization. I have interest in Nihonto for long time but it become intense when i got katana from the bottom of Musi River in Sumatra. Metallurgy wise Nihonto n Kris share lots of similliarity as both created from different kind of steel (soft, medium, hard). In the perspective of spiritual object, Kris and Nihonto also the same. The difference is that Nihonto have many literatur and legitimate authentication entity while Kris dont which lead to many new blade posing as old blade. Selamat datang, Dion! I collect Japanese swords and fittings for mor than 40 years now, and started collecting kris when living in Jakarta from 2012 to 2016. I beg to differ when it comes to (assumed) similarities in the construction of nihontō and kris, and even the spiritual significance (which is much stronger in Indonesia). But both are unique weapons/art objects, and I hope you'll stick around long enough to appreciate the differences, and like nihontō for what they actually are. I have 5 or 6 (what I think are) nice Keris. Will have to post them oneday and get some opinions. Thank you Guido, regarding the similarities yes I could be wrong as I just dive in in Nihonto n do not know much about it. I wish to learn more though as I always interested in ancient metallurgy. My name is Dan and I now live in Arizona. I have been involved in Karate for over 34 years (not very long -since I started training at 35 years of age) and have participated in International and National karate competitions in kumite, kata, and iaido. Of course I have a small collection of reproduction iaito, and katana. I have just very recently started to collect tsuba. I find them artistically fascinating. They are small pieces of beautiful Japanese artwork. Whether they are reproductions or originals (and I am still learning how to discern the difference-great fun getting on the internet and researching all the history and origins of tsuba), I find them extremely pleasing in their artistry. I cannot afford large sums of money, so I have bought some which I could afford (always with an eye towards the artistry of the piece). I was wondering, though, if I have a question about if a low cost tsuba is actually an original (I can always "hope" !! ), can I post it here with pictures and the members of the forum can help me out with identifying it ?? Thank you so much, and a great pleasure meeting all of you !! 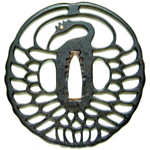 Of course we will happily help you with identifying what TSUBA you may have. Please post nicely focused pictures of your treasures! My name is Gang Wang. I am a Canadian Chinese living in Calgary of Canada. I have been interested in Japanese swords for about 20 years. Most of my collections are Japanese military swords from WWII. I was introduced to this forum by two gentlemen from Canadian gun nutz. Before that ,I have never found such a professional forum about Japanese swords. I hope I can learn more from all of you people and make more friends here. Welcome Dan & Gang! Great having new members. Welcome. You will find quite a few Canadians here, and many that collect army swords. Hope you can share some of your collection with us over time. Hi All, I would like to introduce myself. Having a nihonto have always been my life long dream and I just pulled a trigger on a very good quality katana from Max in NMB buy/sell. I could not be happier. Although I have lots to learn about the subject, I am very keen on studying nihonto. I can see this will become my life long obsession already. Hi Gang, I glad you can join us here. I think I am one of the guy recommend you to come here from CGN. Hope you learn a lot here and good luck with your sale on Wakizashi. Greetings. I currently live in Japan and would like to buy a Nihonto before I leave. Though I am only creating an account now, I viewed some swords being offered by a collector a few months ago and he recommended that I explore this forum in detail and study up before I buy. Thanks in advance for your expertise. That was some excellent advice, Terri. Please add to that buying a few good reference books from Amazon, & doing some studying so you understand what's being said on NMB. One last thought is that swords are often more expensive in Japan than out - not sure why, & maybe working directly with a local collector might get you around that. Feel free to post photos of his blades & prices on NMB for feedback. Enjoy Japan, & welcome to the forum. Hi all, my name is Francois, I'm a french citizen interested in tsubas. I got to discover the world of nihonto thanks to my uncle, I started a very modest collection of tsubas several years ago. I had an account in the past (fritaly) but since I can't access my former email address (where the reset password is sent), I created this new account. Hi Francois and welcome. If your still looking for tsuba boxes there is some for sale in the for sale section. Francois, just message me the details and I’ll change the old email. Rather you use the old account. Welcome, (to all that I missed )!!! Greetings. I'm a collector of edged weapons dating back to the Bronze Age, always seeking better information on what comes through, general knowledge of the eras I have, and detailed information on the artifacts I've collected. Aha! The science fiction writer! Weclome, Michael! I can already see one book of yours that I don't have. You will find a lot of Sci-fi fans here. Glad to have you on board and hope we can be of assistance.